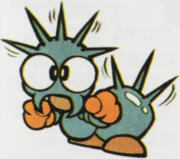 Chikunto are a type of Ant capable of protruding spikes from their bodies, appearing in the Macro Zone of Super Mario Land 2: 6 Golden Coins. If Mario jumps on them when their spikes are out, he will take damage. Usually, they will walk with their spikes retracted, and then stop to stick out their spikes as Mario approaches. Mario must wait before they retract their spikes again before he can jump on them. They are defenseless to a fireball, regardless of whether or not their spikes are protruding. Chikunto From chiku, "prickly," and "ant"
This page was last edited on October 30, 2018, at 21:59.